A “New Paradise” at Sayes Court. are the first, tentative signs of a possible renaissance for Sayes Court! On the 25th of April the Garden History Society and London Parks and Gardens Trust are holding a Study Day on John Evelyn and Sayes Court, underlining the national importance of the site. An exciting programme of talks is lined up. 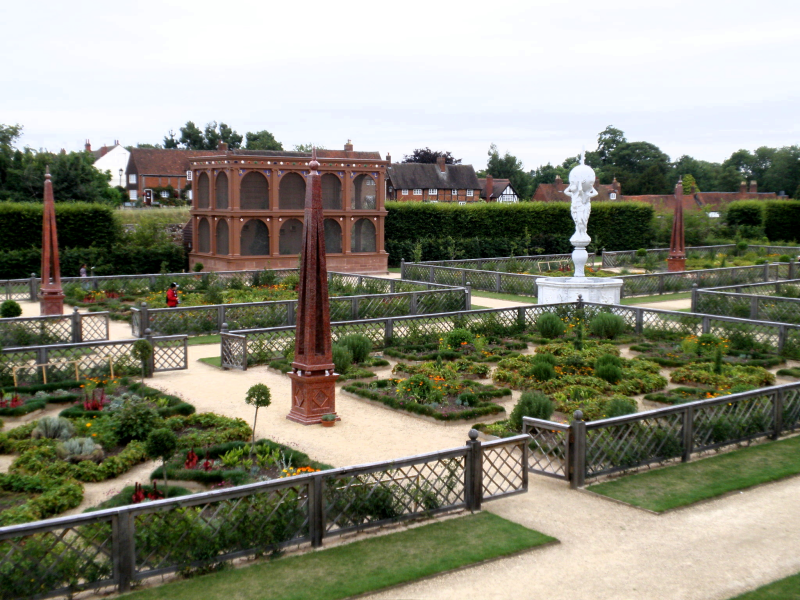 For booking info, see the Garden History Society website. There will be a gathering for refreshments afterwards at the Master Shipwright’s house. Sadly I’m afraid the planned site tour will only be able to view as much of Sayes Court as I have up to now, i.e. a great mound of spoil on top of the back-filled trench. However, the MOL have at last put up a page on their website explaining how they went about locating the manor house. My SO, who did the Google Earth overlays for my earlier posts, has now double-checked this through a careful map regression using ArcGIS Explorer, and has confirmed that the nineteenth-century almshouse and pension office building did overlie the earlier manor house. I’ll have more to say on the manor house, what we can discover from the documentary evidence about its interiors, and the alterations it saw while Evelyn lived there, in a later post. But what about changes to the garden? Like all gardens, of course, it evolved over time. The harsh winters and dry summers between 1683-5 took their toll of damage, and Evelyn, now in his sixties, commented to Pepys “’tis late for me to begin new paradises”, but nevertheless, he rose to the challenge. By 1692 when the above detailed colour map of the estate (copyright the British Library) was drawn up from Joel Gascoyne’s survey, Sayes Court was quite different from the way it had looked in the 1650’s, when Evelyn first laid it out. The biggest change was the seemingly fourfold expansion of area given over to groves. Across the Long Promenade opposite his first, originally highly intricately designed grove, another has taken the place of part of the Great Orchard. The map shows the northern parts of the orchard that bordered the ornamental lake just as greened areas, with no indication of planting, so it is possible there were just flat lawns of grass adjoining the lake, and no trees there, with the exception of a small, intriguing feature facing the northern axial entrance to his first grove. There, trees are sketched in around what looks like a bower with an apsidal niche, which we can speculate might have housed a seat, a statue, or perhaps some instrument of scientific curiosity such as a “thermoscope” or weather-glass, as illustrated below in Evelyn’s “Elysium Britannicum”. The northern part of the Great Broomfield that previously lay outside the garden (beyond the orchard), has been incorporated into it, roughly partitioned into four square plots planted with trees, and quartered by paths. As well as the greatly increased area of the groves, we can see that their internal layout has also drastically altered. The first grove’s elaborate geometrical network of walks and “cabinets” has gone, replaced by a much simpler layout, with a simple circular opening at its heart. Apart from the main central axis, the paths are mostly now curving and sinuous. The next grove, overlying the Great Orchard, is also very much simpler in plan than the 1653 one had been, although still firmly geometrical. Four new groves overlie the former Stallyard end of the Broomfield and the area described on the 1653 plan as an “extravagant area mangled by digging for gravel”. The simplification has gone even further in the eastern two. A single straight path leads to a large circular area in the centre of each grove. Marking the climax of the process of simplification are the two westernmost groves, perhaps the latest parts of the garden to be laid out. Comparison of a detail from Evelyn's 1653 plan with a contemporary depiction of a mine entrance. From Subterranean Greenwich and Kent blog. The southern one is an unbroken block of trees. The northern one incorporates the former gravel pit (and possible mine tunnels) in a very ingenious way, turning the old watering pond that had formed in the man-made depression into an extension of the 1650’s ornamental lake, approached by what looks like a steep descent of steps through the centre of the grove. Thus, it appears that Evelyn was one of the first people to turn an ex-industrial area into a pleasing garden feature! 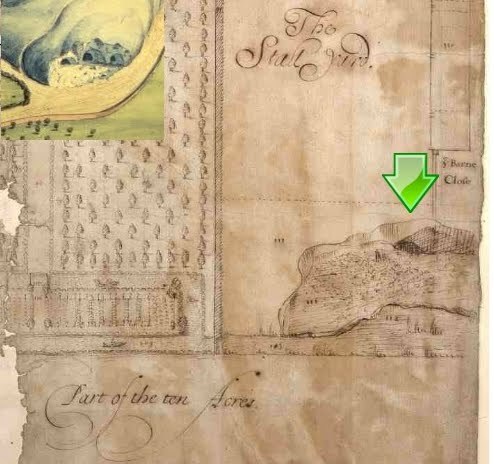 Further research, including archaeological excavation, could potentially shed some light on Evelyn’s approach in this interesting area, although unfortunately, the houses of Barnes Terrace seem to have been built on the site of this western grove. The south side of the garden also now extends into the former Great Broomfield, which has here apparently been turned into grass lawns (known then as “plats”) and long avenues of trees. (But some caution is needed here – see final paragraph below). Finally, the exquisite parterre has gone, replaced by a semicircular bowling green twice its width, straddling the former south end of the Long Promenade. The diminutive banqueting house seems to have vanished, too. Instead, an exit accesses an avenue of trees that runs along the entire southern garden edge. 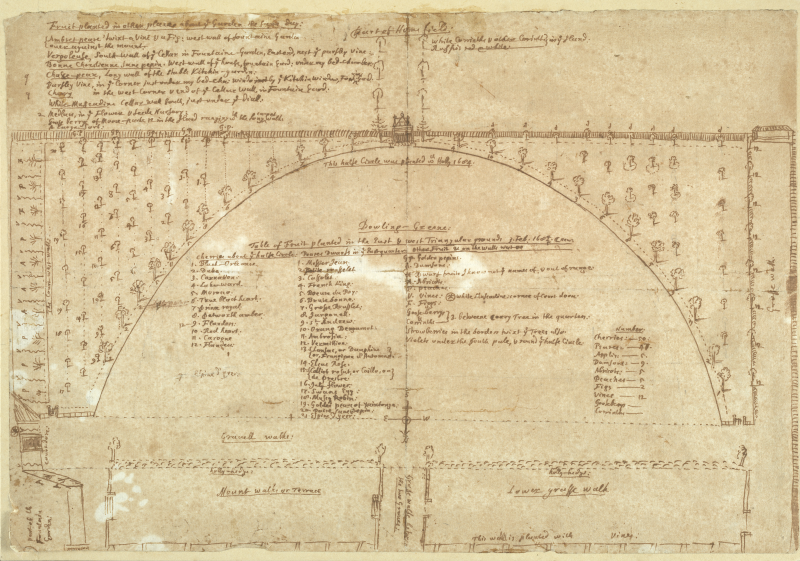 We know that the Gascoyne survey map omits details of planting, such as the many fruit trees and bushes planted in the beds and on the walls surrounding the bowling-green, shown above in Evelyn’s own annotated sketch-plan of 1683-4. The Gascoyne map may also have omitted other details for which we don’t have any documentation, so I think it wise to avoid drawing too-firm conclusions, concerning how much Evelyn was either following or helping to form new garden fashions, based just on the evidence of this map. Even so, it gives us a tantalizing peek into Sayes Court garden in its later form, just a couple of years before Evelyn and his wife Mary packed up and moved to Wotton, the Evelyns’ family home in Surrey…where he carried on gardening! Say what you think – quick! 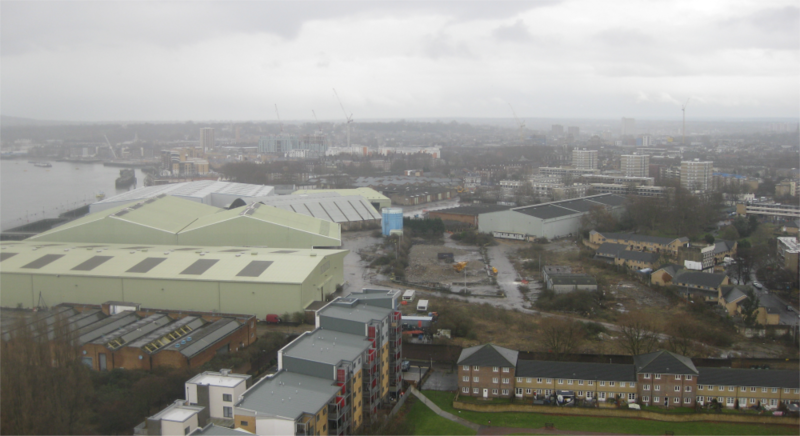 On 15th November local residents hereabouts received a letter from Lewisham Council informing us that we had barely a month in which to send in our comments on the development plans for Convoys Wharf. Hutchison-Whampoa have also belatedly posted a mass of documentation on their PR website, including a report of the archaeological excavations carried out this spring, (on which see my earlier posts). Trenches 33 and 34 from the archaeology report. The report states that two trenches (nos. 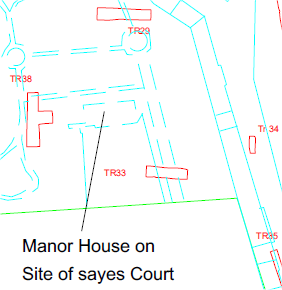 33 and 34) were aimed “to refine and fix the position of the mansion house of Sayes Court”, and yet it’s obvious even from their own overlay plans (part of one, fig.71, is shown on the left) that neither of them were positioned anywhere near the marked site of the house. Small wonder, then, that they didn’t find it! As for the actual garden, the report says (p.80) that they “failed to reveal any significant evidence” for it, apart from a “possible terrace” and part of a ditch in trench 38. Although not stated in the report, this appears to be situated over part of the Evelyn’s “grove” or thickly-wooded area, described in my second Garden Walk-through post. There was a layer of dark soil up to two metres thick sealing these features, and just underlying the modern concrete surface. Was this deep soil not likely to be connected with the woodland planted here? 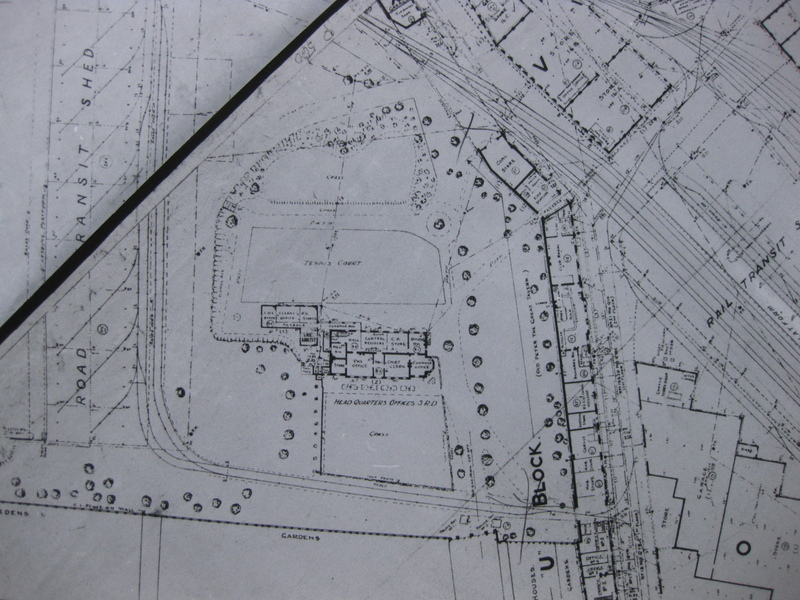 The scattergun siting of the trenches over the Sayes Court area bears very little apparent relation to the detailed plans of the garden and manor-house as they have come down us. (See The key to the garden post) How then can they accurately evaluate the potential for their survival? Such evaluation was the stated purpose of the dig – and the outcome will be used to decide what further archaeology should be done (and supposedly taken into account in the detailed development design and construction). Why, as I’ve asked before, was no specialist in garden archaeology involved in the excavation? The excavators claim to have been in close liason with English Heritage, and yet when a friend called EH this week, they made it clear that their garden archaeology consultant was completely unaware of the present situation. How shocking! It takes interest and motivation as well as experience to identify garden archaeology. 1) Sayes Court is a site of national historical importance. Its archaeology has yet to be properly investigated and recorded. 2) Informed by a thorough archaeological excavation, the development proposals should include a historically-accurate restoration of a substantial part of the garden as a valuable local amenity, an economically-significant visitor attraction, and a worthy memorial to John Evelyn. Lastly, if you like the idea of an exciting garden restoration project, and especially if you have experience of the planning process, garden history or design expertise, please do get in touch. My email address is on the “About” page. Having brushed aside the archaeology, Hutchison-Whampoa have now come up with a new “masterplan” for their proposed development of Convoys Wharf. If you take a look at part of their plan (on the left – easier to read if you click to enlarge it) you can see that they want to build right on top of the historic seventeenth century parterre, completely obliterating at least half of whatever remains of it below ground. 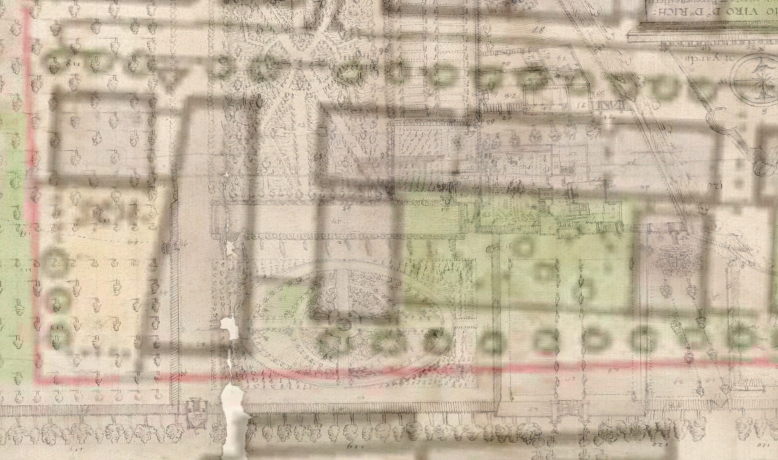 In addition, the same block would cover the northern half of the manor house itself, as well as most of Evelyn’s private garden that adjoined it (which I hope to finally get around to describing here soon). Behind the building a bland, windswept alleyway with a line of lollypop trees would cut through the heart of Evelyn’s grove. It is clear that the proposed general layout of buildings takes no account whatsoever of the historic character of the site. The areas marked in green between the buildings apparently bear no relation to any of the main features of the gardens. Why could they not be sited so that they at least spare them, if not actually restoring some of them for posterity? Why not restore Evelyn’s “private garden of choice flowers and simples”? Why not display, if necessary under cover for protection, what remains of the manor house ? 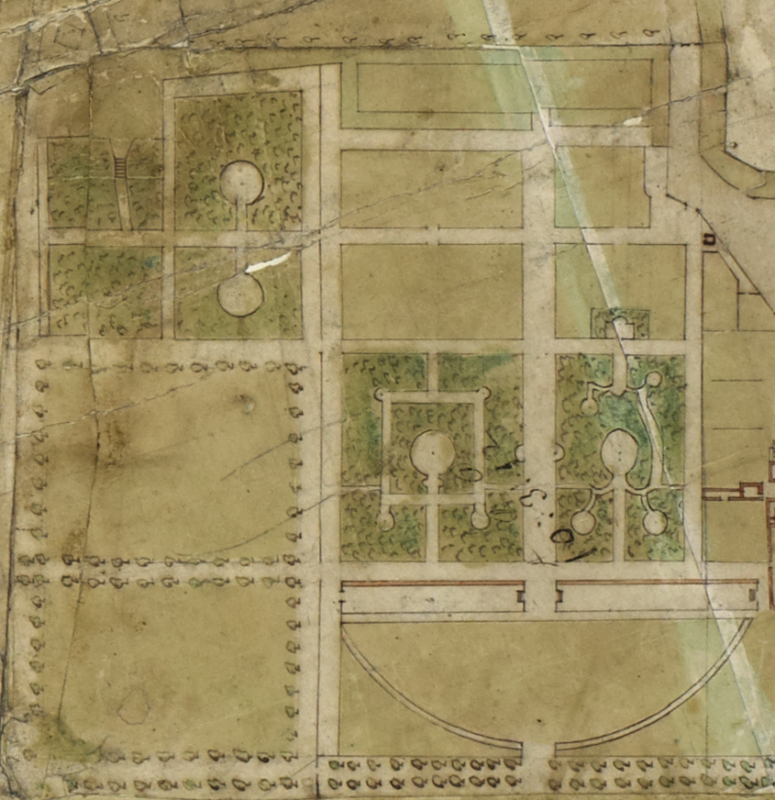 For example, the proposed new school, shown in the bottom left of the plan, has its main wing located so as to destroy the western edge of the (innovative and very influential for its time) parterre. Surely its plan could be revised so that the main wing is moved further west, over part of the former orchard? I can’t think of a nicer neighbour for a new school than a restored historic garden of national importance – what an educational resource and delight it could be! 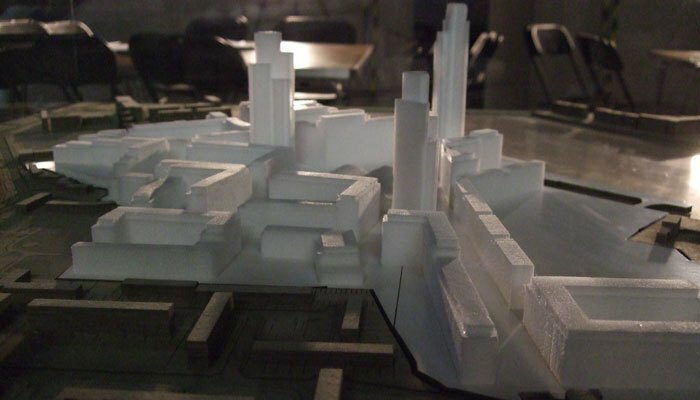 There’s an exhibition and “consultation” taking place tomorrow and Saturday, (Deptford Methodist Church & Mission, 1 Creek Road, SE8 3BT – Friday 9th July, 12pm – 8pm; Saturday 10th July, 10.30am – 2pm). So if you want to voice your opinions on these plans, please go along and let them know that there are people who DO care about Deptford’s heritage, and the quality of its future. The new 2010 plan for Convoys Wharf overlaid on Google Earth. It will take a moment or two to download, then double click on it to open it in Google Earth (which must already be installed). This will open up the image overlaid onto the modern aerial view of the area. Select (by clicking once on it) “New Convoys plan″ in the places panel on the left, then by dragging the slider below (the one that says “the slider sets the transparency of the overlay”) you can adjust the degree of transparency. If you already have the Plan_of_Sayes_Court_House_and_Garden.kmz file from https://productforums.google.com/forum/#!msg/gec-history-illustrated/SKQRekFJGqY/pYJ2-vIFdS4J the location of the various buildings can be compared to John Evelyn’s 1653 plan. John Evelyn’s motto was “Explore everything; keep the best”. (Omnia explorate, meliora retinete) This says so much about the man and his epoch – the excitement of the seventeenth century’s expanding intellectual horizons, along with the confidence that the totality of knowledge could still be encompassed and meaningfully evaluated by an educated person. Such an attitude, in our age of exponential change and information overload, might seem at best infeasible, and at worst dangerously naive. While honestly acknowledging our limitations, however, it seems to me that we owe it to ourselves not to simply give up on the quest for the best – otherwise there’s a risk of just allowing our intelligence to gradually atrophy and our judgement to wither away under the blight of relativity and indecision. Now, personally, I feel sure that since Evelyn’s time, Sayes Court has gone into a steep downward spiral, and that the current plans to build high-density housing over it are the absolute nadir for the site. However, to those whose baseline for evaluation is the present appearance and condition of the place, or even its state in any recent decade back to about the 1950s, it might seem that any development would be preferable to the closed-off, creeping dereliction of what I suspect developers and planners alike both regard as a mere “brownfield”, with some awkward scraps of archaeology that have been given a token treatment (on which, see my earlier posts) to meet legal requirements. But I, and I hope the regular readers of this blog, now realise how different – how much more vital, diverse, stimulating and beautiful – this place has been in the past. How much better than what we see today, and what is threatening to happen to it in the future. Our baseline doesn’t have to be the sterile and semi- derelict present – we can see how it looked in Evelyn’s time, and even get an idea of what baseline he himself encountered, as shown in landscape paintings such as the above, and as I intend to post more about soon. Shifting baseline syndrome, en.wikipedia.org/wiki/Shifting_baseline where significant changes to a system are measured only against recent baselines (rather than against earlier or original baseline states) allows standards and expectations to progressively fall. For example, recent studies have shown that local people can lose all knowledge and memory of the wealth of species that once inhabited their neighbourhood ecosystems surprisingly fast, once they have gone. Similarly, once visible remains of an earlier landscape have totally gone, the public memory of what it was like can quickly fade, and the new status quo comes to seem normal. Such an unconscious loss of perspective can also help to explain why low-grade proposals for so-called “development”, such as those for Convoys Wharf, can be submitted without the kind of adverse reaction and protest that would have met them had they been measured against earlier baselines. I’m not arguing for no-change, or for “turning back the clock”, by the way, but for development that really responds to the unique spirit of place here and creates something in sympathy with it. If we have the courage to try to apply Evelyn’s motto to our choices for the future, I’m convinced we can envision something far more enriching. In particular, I am not alone in wishing to see a historically-accurate restoration of at least part of Sayes Court gardens. 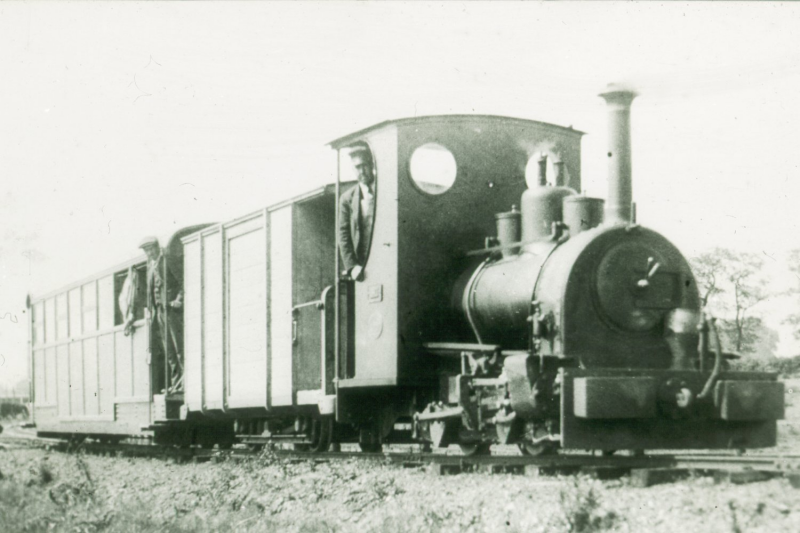 As a recreational and educational amenity to residents and local people, a haven for wildlife and plants, not to mention a sure-fire magnet for tourists, it would bring back real character and significance to this place. But can we persuade the planners and those who hold the purse-strings to back such an exciting restoration project? It was one day early in 2005, soon after we’d moved into our flat nearby, that we first discovered Sayes Court Park, adjacent to the currently-disused Thames-side dockyard in Deptford. I was interested in seeing the wizened mulberry tree at its heart, supposedly planted some three hundred years ago by Czar Peter of Russia, of all people. I was a bit sceptical of that particular legend even then, and am more so now that I have read the contemporary accounts of Peter’s behaviour during his visit. But I was nonetheless intrigued by the idea of a tree surviving from the greener, pre-industrial landscape in these parts. The gnarled but still vigorous and reportedly fruitful mulberry at least held out the eventual prospect of a taste you can’t buy at Tesco. 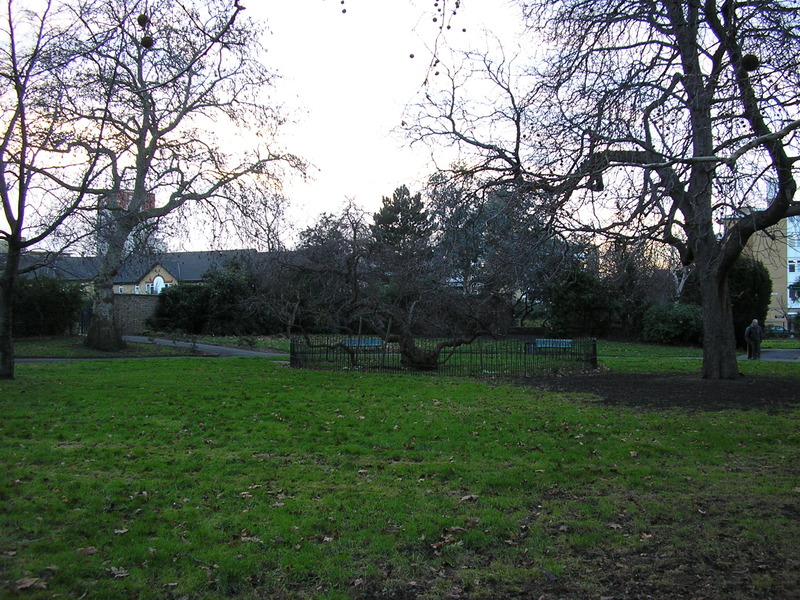 If you ask local people about the park, some will tell you that John Evelyn, a friend of Samuel Pepys, and like him a diarist, had a famous garden there. His house, and the garden, were indeed called Sayes Court. The question was, how much, if anything, remained from Evelyn’s day in the modern park? Once you’ve got your eye in for it – by archaeological fieldwork, surveying, studying old maps – you develop an almost tangible sense of the past under your feet. A sort of space-time-penetrating vision. This feels completely natural to me, even if I don’t draw on it much these days, unfortunately. Anyway, doing my best to tune into what you might call this past-detector, I scanned the ground eagerly, hoping to spot something – an anomalous bank, or the parch-marks of an earlier planting layout, or a shard of seventeenth century pottery – anything to connect with what was there before. But the park, despite bearing the name of Sayes Court, initially appeared to be just a rather run-down, reduced-to-low-maintenance relic of the nineteen-fifties. A few ubiquitous plane trees and shrubs and predictable rows of roses, but otherwise, sadly, not much apart from concrete paths and grass. So, I began to feel curious to find out what had become of Evelyn’s house, and especially, his renowned garden. What kind of garden was it? Had it really been completely lost? I began to delve deeper.